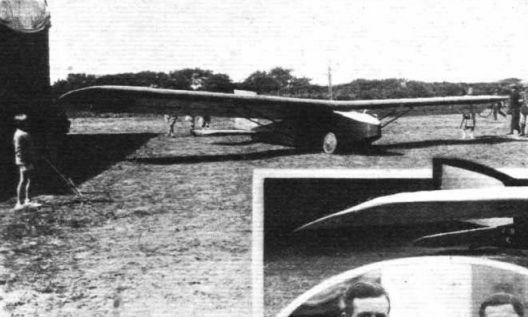 Among the gliders taking part in the Vauville meeting, first place should undoubtedly be given to the Abrial type A.2 ("Vautour"), which was designed by M. G. Abrial, and built by M. L. Peyret. ДальшеMore>>> We gathered that a scale model of this glider was first tested in the wind tunnel at St. Cyr. When the actual glider was first tested at Vauville it was found to be absolutely "right" in every respect, and as it was elaborately fitted up with recording instruments of all sorts, it was possible to ascertain the scale effect between the wind tunnel model and the full-size glider. In general arrangement, as shown in the accompanying scale drawings, the machine is somewhat after the famous German "Vampyr" type, but with a more rounded nose and with strut-braced wings. The wing section used is somewhat similar to the Gottingen sections, although the mean camber curve is stated to be different from those of the Gottingen sections. The construction is one of the prettiest pieces of work which we have ever seen, and is a credit to M. Peyret. It was on this glider that M. Auger reached an altitude of 720 m. (2,360 ft.) above his starting point, and glides of 4 1/4 hours' duration were also made on it. OFF FOR A GLIDE: The Abrial "Vautour" ready to start, and, inset, in flight.